This weekend I put together a 5' by 16" shelf cabinet in the garden shed designed for storing all those extra pots. Well not all of them - I just have too many - I need more shelves! It's made from 1"x11" painted boards and mounted with a 2"x4" backing. Finish nails and a few screws make it very sturdy. I have a few more pieces of the same lumber that I can use to make a some more shelves for the garden shed. It's was a very easy project and I'm pleased with the results! 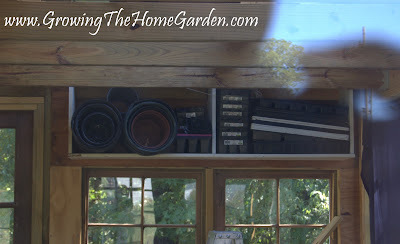 How do you store your extra pots? glad we've bought this little house of joy. Looks nice and neat Dave! My pots are stored behind my compost bin-most of them. Some are in my potting bench. Too many too though!